One of the more common arguments we’ve seen against having light rail to the airport, even though it’s not only about the airport, is that heavy rail is faster. A simplified version of the argument is that our heavy rail trains can travel at up to 110km/h so that is better. This post isn’t actually about the airport, or even heavy vs light rail, but instead about impact that faster speeds have on travel times. It comes as the by-product of another post I’m working on, which I hope to publish soon. I’ve created a model to estimate how long it will take to travel between stations based on the distance and the maximum speed allowed. While working on it, I started to notice some factors making a bigger difference than others. So, I decided to look at that in a bit more detail which lead to this post. The model is based on some information AT gave me about our electric trains at the time they were first being built. It was reported at the time that the trains are capable acceleration of up to 1m/s², however this information shows they can only sustain that up to 35km/h, after which the rate drops off. The same thing with braking too, with the trains able to brake at 1m/s² up to 50km/h. The profile for both these is below, although it also assumes flat tracks and normal conditions. So how does that translate into travel times? For the purpose of this post, I’ve assumed that regardless of the type of rail, there’d be a broadly similar profile to above. I’ve then compared travel at various maximum speeds over two distances, 800m and 2km. I chose 800m as it is similar to what the average spacing of the proposed light rail stations on Dominion Rd will be, while 2km is closer to the average between Dominion Rd and the airport as well as on most of our heavy rail network. I found the results fascinating. For this I compared maximum speeds between 30 and 80km/h. The travel times varied between 1:01 and 1:44 however, as you can see the gaps between them aren’t consistent. As a result, a vehicle travelling at a maximum speed of 70km/h would arrive just one second after one travelling at up to 80km/h, followed another three seconds later by the one at 60km/h. In case people don’t quite believe there is only one second difference between 70 and 80km/h, think of it this way. Something travelling at 80km/h will cover 22.2m every second while one at 70km/h will cover 19.4m every second. In the 14 seconds it takes to accelerate from 70km/h up to 80km/h and then brake back down to 70 again there is a difference in the distance covered of just 25m. So it takes the slower vehicle just over a second longer to make that up. As the speed increases you can really see the impact of those slower acceleration times with it taking longer to get from 100 to 110km/h than it does to get from 0 to 40km/h. I was surprised when this came out again at almost exactly the same as the graph above, only on a slightly bigger scale. In this case, a maximum of 90km/h seems to be the sweet spot with a vehicle arriving just four seconds behind one capable of reaching 110km/h. So why is all of this important. Perhaps unsurprisingly, what these two examples show is that vehicle speeds need to be considered in relation to the network they’re operating on. For most of our rail network, light or heavy, existing or proposed, there is actually not a huge benefit from being able to travel much faster than about 90km/h. On urban networks the rate of acceleration is actually more important than the maximum speed. A high top speed only really becomes important for longer distance journeys where there is the ability to cruise at that speed for an extended period of time. I look forward to sharing the rest of the outcomes from this model soon. Same argument for the 80 vs 100 km/h on the North-Western. 80 km/h feels so slow, but travelling 100 km/h over 5 kms is only 60 seconds faster. There’s a related argument why an 80km/h speed limit on a rural road doesn’t mean a 25% longer journey than if it was posted at 100km/h. Much of the journey on your typical winding rural road where this would apply already has an operating speed <80km/h (curves, settlements, etc) – these sections takes a longer time to travel per km, and so they already make up the greater proportion of your travel time. And of course, what is true for trains is also applicable to cars and trucks on roads. Except for fully grade separated routes, traffic will always be slowing for tight bends, intersections, etc and accelerating away again. This gives the same diminishing return on overall top speed, with the associated increase in accidents and pollution being further points against driving fast. Light rail trains have significantly better acceleration, and particularly deceleration speeds (because most of them are designed for on-street running, where they need to be able to brake somewhat more like a car than a train – and, well, they *are* lighter in terms of body construction etc). Of course the maximum acceleration/deceleration may not be desired for standard operation (2m/s which many can achieve would risk throwing people around inside the LRT) – but it definitely provides a leg up on LRT compared to heavy rail in a comparison which includes this, rather than leaves it out because we don’t know the exact details of the chosen LRT yet. The below link, on Page 99, gives some example values. 1.2m/s for acceleration and 1.3 to 1.5 for deceleration seems typical. Damian, the current Auckland EMUs with their high power-to-weight ratio and 66% of axles motored are also capable of significantly greater acceleration, but are limited to 1.0m/s² for reasons of “passenger comfort”. For some reason, heavy-rail passengers are believed to need greater “comfort” than light-rail passengers or bus-passengers. This is determined by policy, not by science or by technical capability. Accelerations of 1.3m/s² or more can routinely be found on heavy-rail metro operations elsewhere. I disagree with the rationale that such conservatively-pegged acceleration rates are necessary for passenger-comfort. What destroys comfort is not acceleration as such, but rate-of-change of acceleration – i.e. sudden jerks and lurches. There is nothing wrong with higher accelerations if they come on and go off smoothly and predictably without jerking. This is just another example of where our heavy rail is unnecessarily slugged with a different set of standards from other modes. And I suspect that in reality, Transdev drivers usually do not even use the full 1.0m/s² available to them, as timetables have been so padded that they don’t need it. Yes 100% agree – I like this post as it makes no assumptions ‘LR better than HR’ or visa versa. Our HR system, is ham-strung by so many little bugs that make the overall system slow & un-reliable. If/When a LR system is designed for Auckland, I really hope that it’s not severely limited by overly restrictive constraints. Could it be so limited with our current EMU’s due to the general track condition which is often rough and rugged in places? I’ve found that standing if not hanging on or say changing seats and some initial jerky take-off occurs it can nearly throw you a bit. Once you know it’s speeding up or slowing it’s not so bad. Not sure if LRT (also given that it would be on standard gauge) would be any smoother? While what you’re saying is true enough, Dave, including the part about drivers not using the full acceleration, there is a lot more to it. The main thing is that whatever capacity you can extract under ideal conditions is of no use to you the rest of the time. In very much the same manner as this posts depicts with top speed, there’s no point timetabling for ideal conditions if that means that 10%, 30% or 50% of the time, less than ideal conditions mean that trains will be unable to keep to schedule. Whether by location, or weather or time of the day or time of the year, the tracks in Auckland are frequently unable to support even 1.0m/s². When that happens and wheel slip protection kicks in, it really does kick, resulting in quite a rough ride. Several stretches can occasionally, virtually without warning, become so slippery that the EMUs can’t get over 35km/h. Newmarket to Grafton is the worst of those. I hasten to add that we’re not at the a punctuality crisis point yet, but there’s only so far we can go before it costs in punctuality and reliability. I’d estimate that there’s only scope for about a 5% increase in the acceleration limit before it’s a net cost. Agreed Glen, that bad-day conditions can hamper the performance of the trains, but serious cases of this will be location-specific. For example the Newmarket->Grafton stretch you mention has gradients of 1:40 – 1:50 with a short section at 1:36, so this is an extreme case where one could expect performance issues. Much of the network would be a lot less vulnerable to performance-degradation than this. Certainly if the timetable were sharpened to better-match the trains’ capabilities, you would still need to build in allowances for the trouble-spots. However as others have pointed out, cutting dwell times and other time-consuming practices could have a much bigger overall effect than boosting acceleration. Heavy rail wouldn’t work. They would stop and wait an extra minute at each station while their daft door opened and ramp came out. The HR trains need at least 5 seconds to work out they’re stationary before they even let the doors begin to open and that is on segregated rail track. So I would expect AT will at least double that delay for LR, after all, this Auckland, nobody does it better. Good analysis Matt. What it also implies is that there is much more time-saving to be gained by raising low speed limits than raising already high ones. For example, the 630m stretch from Stanley Street overbridge to Quay Park Junction via “Vector curve” used to be limited to 25Km/h but was raised to 30Km/h for ETCS-equipped trains. 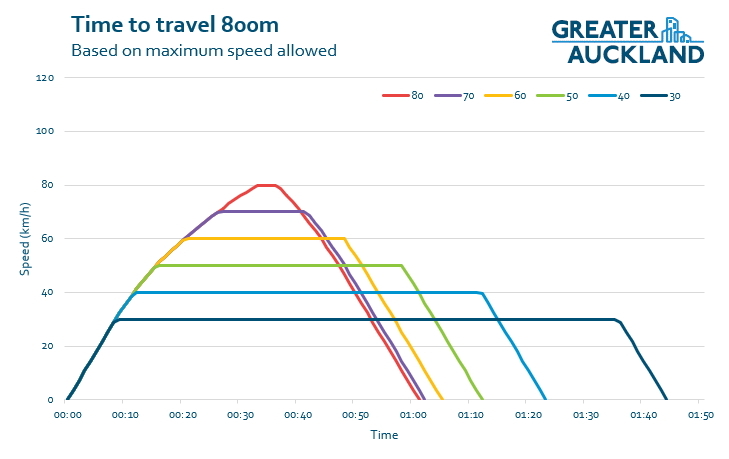 Hence in a stop-start metro operation such as Auckland’s, it can often be better to focus on improving the areas of slowest restriction before trying to improve the higher speed areas. indeed, fixing up temporary speed restrictions should be the first port of call. Unsure how many there are on the Auckland network but there was a fair few when I drove trains there years ago. Nothing more permanent than a temporary speed restriction on NZ’s rail network. A complete insult to intelligence. Good article except that at sometime in the future, maybe not too far away, we will have express metro services to get overal times from distant western and southern significantly reduced. What is really going to make a difference to total travel times is frequency, Heavy rail to the airport would effectively be a spur off the southern line unlikely to ever justify more than 10 minute frequencies. Light rail along Dominion road (and potentially to North Shore) may justify even 2 minute frequencies. That difference in wait time will more than make up for any speed difference. Wouldn’t you extend Onehunga to airport and connect airport into Purunui and hence you can run trains in a big loop? Potentially both directions as ridership grows (which has been recent experience in Auckland!). Having Manukau on a branch was a big mistake IMO, but a cross platform change at Purunui for Manuukau wouldn’t be an issue. Interesting, this does also show how much impact dwell times at stops has on the overall “average speed”. Which may pre-empt your next post a little Matt, and if so, I do apologise. You can in fact more or less see that impact of dwell time by using these graphs in reverse. Look at the time taken from “go to whoa” (i.e. the point where the various coloured lines meet the graph on the right). It you took that time as “travel and dwell time combined”, then you can work out your average speed across the distance when you include your stopped [dwell] time. You can see for instance on the second [2km] graph that if you travelled at 110 km/hr from station A to station B, then departed immediately from station B [stop then go – no doors, nothing – not that our EMUs can actually do that I think]. At 1:45 station to station “go to go again” time you would achieve the perfect maximum speed average of 110 km/hr over the distance was achieved. Of course that’s pretty useless for a train stop at a station for people to get on/off. But bear with me while I do the next point..
Now, add 35 seconds of dwell time to your stop at Station B before you go again. So you now stop and then depart at 2:20 after leaving A. Look along the graph to the coloured line closest to that, and you have the dark blue line representing 60km/hr. This means if you leave Station B at or close to 2:20, it doesn’t matter how fast youy covered A to B, by adding the dwell time you have impacted your journey average speed. In this case, even if you go from A to B at max speed of 110. Then if you leave B at 2:20 after leaving A. Suddenly your overall “average” journey speed from A to stations after B has now dropped massively from 110 km/hr journey, back to a “mere” 60 km/hr overall – even though you actually move on the tracks at 110km/hr. 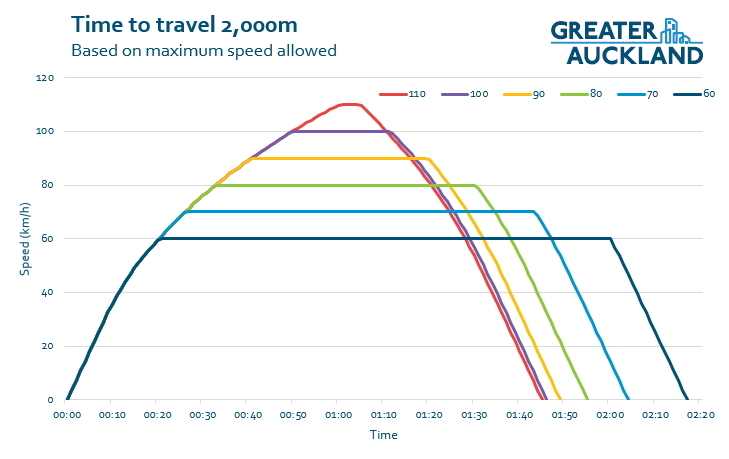 Now, cut the dwell at B to 20 seconds, so you now leave on or close to 2:05, closest line on the X axis is now the light blue one for the 70 km/hr – so this means that just by cutting dwell at one station by 15 seconds you have improved your average journey speed to 70km/hr. Rinse and repeat the same across the whole journey from Papakura to Britomart you can see what a difference that will make to your overall journey time – both perceived and real. Of course, that goes to say we need the fastest accelerating and decelerating trains (be that EMUs or LRVs) we can get, but also means in turn we need the train control system (ETCS) to try and help us use that capability – not hinder us from doing so as we seem to get now. Getting fast overall journey times really needs a lot ducks to line up in a row, not just the single idea of putting the foot on the [electric] gas pedal and just go as fast as you can. Exactly. You could easily increase average speed on the Western and Southern lines simply by cutting out the the huge amount of cumulative time wasted sitting at stations with the doors closed. 3. when approaching Manukau; wait for a train coming out. In the two latter cases, it’s two track; why does this happen? 1. We’re stuck with that until the CRL. Then it will only happen when the timetable is pushed to the limits again in 20 years or so. 2. Grafton to Newmarket you’re waiting for a Papakura train to vacate platform 2/3. 3. That usually means the inbound train is early. They use the Up Main platform to get the outbound train off the branch asap and prevent it from delaying the following Papakura to Britomart train. The next timetable will probably see that interplay eliminated, but others will emerge. Sounds plausible on each count. TYVM. How confident Light Rail on dominion doesn’t need to stop at traffic light, or blocked by one turning car? Looking at the graph, if the train stopped once between 800m (2×400), the time taken for the trip will triple. So the most important thing is make sure the light rail does not stop between stations. Another thing to point out is, there will be significant time savings if heavy rail can run express train that skips multiple stations at highest maximum speed, like onehunga line. With 3rd main, we can actually investigate the possibility to run express train for southern line and western line. Regarding to light rail, we may need to buy high performance train that accelerate faster. For heavy rail, can we remove the cap for ETCs acceleration rate after station departure? For the next batch of EMU, do we have the option to upgraded motor and electrical system to improve acceleration and sustain that acceleration at high speed? Kelvin, ETCS does not limit acceleration rate. The prolonged low speeds you observe on departure from some stations occur where a hazard such as a level-crossing or merging-rail crossover exists just beyond the next signal, and ETCS holds the train at a slow speed just in case the driver misjudges and over-runs the signal while it is still at “stop”. Also with the ETCS system we have, the ETCS computer may not know that the signal has changed to “proceed” until the train actually gets there, meaning that the train may be forced to creep up to the signal even though the way ahead is clear. Devices could be installed to overcome this problem but would need more $$. Many might say that this is safety-cautiousness gone mad, but incidents have happened pre-ETCS where crashes have resulted. It is just such a damn shame that nothing like this exists to protect against everyday road crashes. And it will be interesting to see what sort of regime LRT ends up getting clobbered with. Correct, infill balises is the first way. The second is ETCS L2, but for a number of reasons, that’s a way off. As it stands, infill balises are also delayed until other ducks are put in a row. Good analysis. Ignoring the engineering point if view and looking at it from a marketing POV a good many passengers getting on in town want only to go go the airport. It isn’t really a light v heavy argument it’s local v express. Maybe the airport should have both … Light rail from Dominion Rod and a heavy spur from Puhinui. And here’s a thing… Maybe the Waikato fast network thingy should have trains that terminate at the airport. Maybe the airport will remain the place to go to catch “flights” to the central North Island, just that the flights are served by trains. Yes. With more track coming to the southern and eventually the eastern line, intercity trains stopping at Puhinui will then be able to speeddirectly to Britomart (perhaps with one more stop) so offeing express services. Maybe around 30mins. So between these services, standard all stoppers also from Puhinui for intermediate destinations, and Light Rail through Mangere and the Isthmus, a whole range of destinations and speeds will be available for Airport and Airport area workers and visitors. Plus of course the Express bus for eastern suburbs too. AKL will go from very few poor options for this area to a rich range. Huge and transformative upgrade. I’m expecting that over time there will be more than one rail connection to the airport, servicing different needs and destinations, they probably won’t be built at the same time, so a more important question is what is the first transit link we want to put into the airport? Rapid bus lanes from Puhinui would be the quickest and cheapest connection. Then it serves the existing rail network perfectly. Price is more important than speed. If you have made up your mind to use Public Transport either because you prefer it or you can’t afford the alternative or even you just want to do the right thing you will take the time that is necessary.to make your journey. The other thing is reliability which is why the new bus network is working so well out here in the south.You can depend on it even if its not fast. Previously with all bus routes starting in the CDB buses were always late by the time the turned up in Otara, Mangere and Papatoetoe. PS Why dont we get a proper spell checker which doesn’t show errors when we enter Maori place names into the comments. Probably the biggest factor in people’s choice to use PT to get to the airport will be the saving on parking fees and removal of the risk of having your car stolen or vandalized in the car park. I hope that the Tilt Trains proposed for Regional Rapid Rail will be able sustain acceleration of 1m/s² well above 35 km/h, otherwise it will take several minutes just to reach their maximum speed. Acceleration is not that important for intercity trains, they have plenty of kilometres between stops to get up to speed. A big issue also is whether the O/D pattern best supported by only an all-stops service or should there be express services between major hubs overlaid on top. This has a significant impact on the type of system that should be provided. Very interesting analysis. I know you were trying to keep away from the LR vs HR issue, but as you say, it does have implications. The heretical question is: “does it matter?” Specifically, does it matter whether LR for Airport-City travel is a couple of minutes slower than HR for the trip? I appreciate it’s not all about the Airport, but this is the example most commonly quoted, so I’ll stick with that. I say “no”. I think that the time difference between the two modes is sufficiently small that it will make no difference to the decision by the weary passenger arriving at the airport as to whether to take public transport or whether not to do so The route followed (and hence the catchment) and the frequency are much more likely to be the factors which determine usage – certainly they are when I make decisions about using public transport. From a personal perspective, time spent on public transport is actually “productive” time – but in a different way from the way most people would think. I can read the newspaper (OK, on my cellphone), play Sudoku, and just plain wind down after a hard day at work. None of these things can I do in the car. Am I even aware as to whether my journey has taken 42 minutes or 44 minutes (or whatever)? Not at all. And I’d suggest that hardly any (if any) of the GA readership could honestly say that it’s a major factor in their decision making or that they even notice the difference. Of course we should strive to make the public transport journey as fast and pleasant as possible. But let’s not overplay or stress about the significance of a couple of minutes’ “advantage” for one mode over another on a 40-minute odd journey. Agree, although when we have multiple small causes of two minutes delay that is when we end up with a trip between Papakura and Britomart that is 10 mins slower than it should be. Last week met a neighbour who owns a beautiful high powered European car, what do you reckon, 0 to 100kmh around 5;seconds with braking to match. He was just heading out on his new electric bike. Previous week he’d taken his car to a meeting in the City, 2.5km away and it had taken him an hour to get home. Hi Matt, thanks for the very interesting post. I have been pondering over a few technical points since reading your post. I apologize if I am preempting your next post! I have been trying to understand why the first graph is that way it is. I presume that the acceleration drops off above 35 km/h because of the increasing air resistance. What would be the best way to improve this? Better aerodynamics? More powerful engines? Lighter Trains (light rail)? I am also very confused about the breaking profile. Why is it that the trains decelerate at a slower rate at a higher speed, I would expect that air resistance would make it easier to decelerate at higher speeds? Sam W – physics: Kinetic energy goes up as a function of the square of speed. There will be a limit to the amount of power that the vehicle can draw from the supply source. Going by the first graph, that limit would be reached at 35kph. Beyond that speed, for a fixed increment in additional energy added, the amount of speed increase will decay as a function of the inverse of the existing speed. Hence the 1/x shape of the curve. It will be the same with braking. the vehicle will only be able to bleed off a certain amount of energy in a fixed time period – be that through brake pads or the motor acting as a generator to put power back into the catenery. Below a certain speed that rate of energy bleed lets the vehicle decelerate at 1 m/s/s, above a certain speed that bleed rate is not enough to achieve that level of acceleration. The straight/horizontal part of the graph is the adhesion-limited part. At these low speeds it is the coefficient of friction between rail and wheel and the proportion of powered axles that determine the maximum power that can be applied. More power results in wheel slip and damage so the control system limits the power that is applied. There comes a speed where the power rating of the traction motors (not the energy that can be extracted from the supply) , the proportion of powered axles and the train mass set the limit. Since power can be expressed as the product of force and speed it follows that as the speed increases the available force (torque) from a constant power motor decreases and hence the rate of acceleration decreases. An EMU designed for high acceleration will have all axles powered, high-power traction motors and a good wheelslip control system. Using a rule-of-thumb adhesion coefficent of 25% such a train could regularly achieve accelerations of ca 2.5 m/s² up to the adhesion/power transition point on straight and level track. This chart is of CONTROL ENVELOPE and is not full representative of real motion. The flat line is the specified 1.0m/s/s maximum acceleration limite as chosen by the designer and client to suit this network ~ can be chosen higher or lower. The curved line as described by Kristin is defined by the current limit of 87-90 Ampere available to the unit which begins near 50km/h and higher. Adehesion limit described by MFD is a different line ~ variable by conditions. Usually higher than this chart ~ when adhesion limit is lower than this line, wheel slip protection reduces power to affected axles. 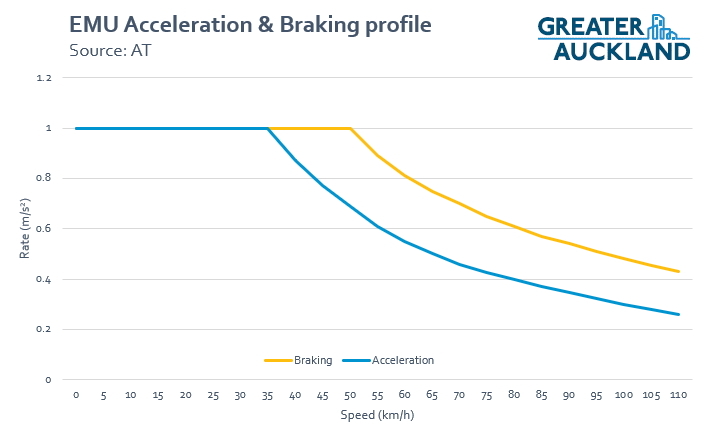 This braking curve is theoretical only ~ operation matching this curve would cause passengers to chose a bus next time. Either light or heavy can be made to accelerate, travel and brake the same. However this is moot when the light rail is not in its own dedicated corridor. Running at grade along roads between CBD and SH20 provides ample opportunity for hold ups, crashes, cars queuing through intersections, etc. It doesn’t mattter how fast a service might be if there is a risk of unreliability. This is the advantage of our heavy rail that is or will be largely seperated. It would be interesting to know whether the delays caused by accidents blocking LR tracks would be more or less frequent than the delays caused by signal faults on the HR network. Car crashes blocking Dominion Road are less frequent than cars going through barrier arms on Auckland level crossings. Just reading up about this etcs and its all about safety. Is there a similar system for light rail? Any info on what is proposed for Auckland light rail? Also, as we refer to other overseas Light rail such as Seattle, is there any stats on accidents involving lrt? It would be good to see stats, especially if someone has compared the accidents involved in moving a certain flowrate of people by LR, HR, and cars. The width of road required for the cars would surely put pedestrian danger into a totally different level than that for either LR or HR. See globaltelematics.com for some interesting info about light rail accident stats. The Seattle LR has opposition yet GA holds it up as a good example of success. Light rail to the airport is the type of madness that ONLY people in political power or ‘policy circle’ wankery in Auckland can muster. So desperate to get their hands on the kitty (money) they don’t really care if the scheme is completely mad and now they have committed it is like pulling teeth to get the proposal seriously reviewed. I’d love to hear what you think of the people who muster ideas like RoNS. Do they get strong words, too? Don’t get me started on the money we waste on roads, but more than the money, the quality we get for the $ spent compared to overseas. I’ve recently seen a 2 lane medium size roundabout undergo works which took years to upgrade resulting in a larger 2 lane roundabout at an enourmous cost. However, for dedicated pathway LRT such as the section Onehunga to Airport or the northern busway where mixing modes is not an issue then go LRT. Light rail is designed for street running or higher density population areas – even if you build some of it with dedicated ROW. Light rail also generally has more frequent stops because that is the nature of the system, for example you would want frequent stopping in the city. But as for loading it with airport bound passengers I can’t see it as being effective. If you have to build a huge amount of a system with dedicated ROW may as well build a proper automated metro and solve the problem for the long-term. Being NZ I’m sure we’ll get a fleet of Tuk-tuks.